This post is definitely a bit delayed, but better late than never, right?? I’ve received a lot of emails asking for this recipe, so here it is 🙂 It’s quite an undertaking, but it’s worth it! 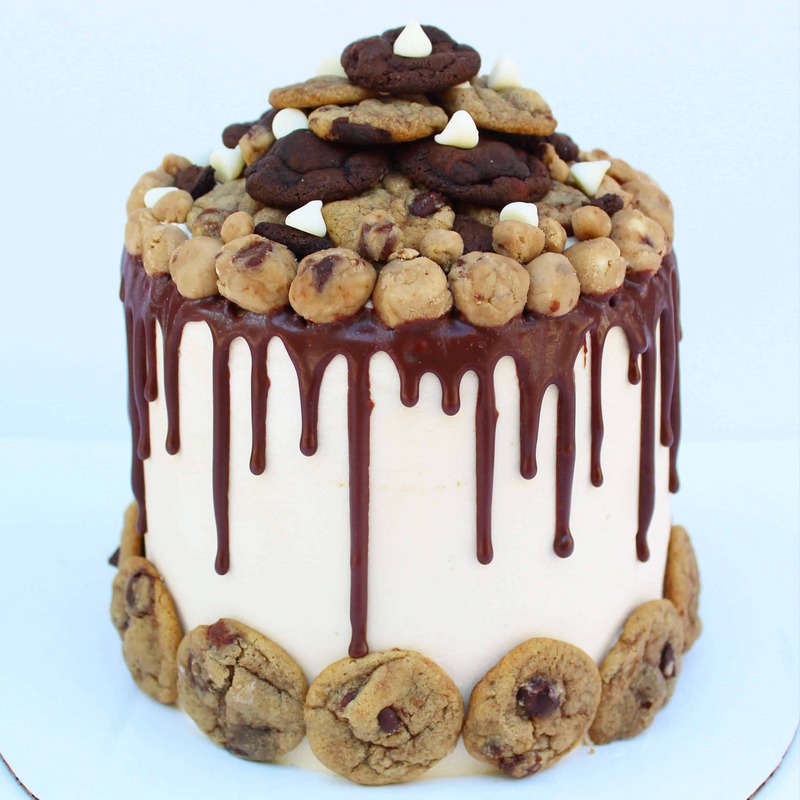 It is made with four super moist chocolate cake layers, a cookie dough flavored buttercream, and is decorated with egg-less chocolate chip cookie dough and mini chocolate chip cookies. It took a little bit of experimenting to get this right. I had been pretty dissatisfied with most of the edible cookie dough recipes I’d come across online, so i tweaked the recipe until it as just right. I also created a simpler cookie dough buttercream, as most recipes require melting down the brown sugar. Mine is just as easy to make as regular buttercream, and in my opinion has a better cookie dough flavor! Preheat oven to 350º F. Prepare four 8-inch cake pans by spraying with baking spray, and lining the bottom of the pans with parchment rounds. Add flour, sugar, cocoa, baking powder, baking soda, salt and espresso powder to a large bowl or the bowl of a stand mixer. Whisk through to combine or, using your paddle attachment, stir through flour mixture until combined well. Add milk, vegetable oil, eggs, and vanilla to flour mixture and mix together on medium speed until well combined. Reduce speed and carefully add boiling water to the cake batter. Mix until fully incorporated. Distribute cake batter evenly between the prepared cake pans. Bake for 25-30 minutes, until a toothpick or cake tester inserted in the center comes out clean. Remove from the oven and allow to cool for about 10 minutes, remove from the pan and cool completely. Once the cake layers are out of the oven, prepare the cookie dough. Combine the flour, baking soda, cornstarch, and salt in a large bowl. Set aside. In a medium bowl, mix the melted butter, brown sugar, and sugar together until smooth. Whisk in the egg, vanilla, then the egg yolk. Pour the wet ingredients into the dry ingredients and mix together with a large spoon or rubber spatula. The dough will be very soft, yet thick. Fold in the chocolate chips. Form 1 inch balls with the dough, and then cover and chill in the refrigerator for at least an hour. Line two large baking sheets with parchment paper or silicone baking mats, and leave at least 2 inches of space between the cookies. Bake the cookies for 11-12 minutes. The cookies will be very soft and look a little underbaked. But don’t be scared, they will continue to bake on the cookie sheet! Allow the cookies to cool on the cookie sheet for 10 minutes before transferring to a wire rack to cool completely. While the cake layers and cookies cool, prepare the cookie dough frosting. Beat together the butter and brown sugar on medium-high speed for 5 minutes. Pour in the vanilla and salt, and beat until combined. Reduce the speed to medium-low and slowly add the powdered sugar, a little at a time, until it has all been incorporated. Add heavy cream as needed. Increase the speed to medium-high and beat for an additional two to three minutes, until light and fluffy. For the edible cookie dough, cream the butter and brown sugar together. Add in the salt and vanilla, and beat until combined. Mix in the flour in two installments, add the cream between installments to help the ingredients come together. Gently mix in the chocolate chips on a low speed, or with a spatula. Form into 3/4 inch balls, and refrigerate to allow the cookie dough balls to firm up. Once all the components are prepared, it’s assembly time! Top each cake layer with a thick smear of frosting, and sprinkle a generous handful of edible cookie dough on top of the frosting. Repeat, stacking all four layers. Apply a crumb coat to exterior of the cake, and refrigerate to let the frosting firm up. Remove from fridge, and apply another coat of frosting. Smooth the frosting, then press the small baked cookies around the base of the cake. Push edible cookie dough bites around the side of the cake, and fill in some of the open space with mini chocolate chips. Form a circular cookie pyramid on top of the cake, anchoring each layer of cookies with a smear of buttercream. Use the remaining edible cookie dough to create a boarder around the top of the cake, and sprinkle white and regular chocolate chips into any open spaces, and around the boarder. And about 5 1/2 hours later, the cake is complete!! Oh my! I saw this and immediately called my sister, who loves cookie dough, over and we both just gawked. You are amazing. What about the chocolate drizzle ? What is it , and how did you get it to drizzle neatly ? It’s just a chocolate ganache! equal parts chocolate and heavy cream. I use a cheap squirt bottle to drizzle it! Is it okay to make it a day before a party? Like does it stay as good and all even if it sits in the fridge? Yes definitely! It can keep for a few days refrigerated. I saw that you said it can last a few days refrigerated…however say i make this the night before – i will keep it in the fridge, but the day of the event how long can it be kept out of the fridge? Thank you! For several hours! The buttercream will keep the cake moist, and the cake will be fine if left out for most of the day. For the cookie dough buttercream frosting your directions say add vanilla but your ingredient list doesn’t list vanilla….how much vanilla should you add? I’m making this today, it’s perfect for their birthday. The instructions say prepare 4- 8″ pans but then in the cake directions it says divide batter between the two pans. Either you’re using 6″ pans to create the height, or I’ll be making a second batch of cake batter. I’m a baker so I can figure it out, but you might want to make notes in the recipe. Your cakes are fantastic! Typo! It’s between four pans. The batter rises quiet a bit, and with the cookie dough between the layers, the cake gets a bit of height!! Can’t wait to make this for my son’s 17th birthday! Since I’m disabled, I need to make the process shorter and easier. Should I use 2 boxed cake mixes or 1 box? I’m guessing 2, since it’s 4 layers. Also, you’ve got a couple different designs for this cake – both gorgeous! But I love the presentation of the other one with a ginormous chocolate cookie on top! Also, not sure if I want cut up cookie pieces in between layers (like in the other design), or if cookie dough would be better. What’s your preference? haha thanks, we think alike! I made the ganache in advance and have it in the fridge. Not sure what temp it needs to be at for the dripping effect. Maybe reheat over a double boiler and cool to about room temp? Yes! I like mine a little bit warm for dripping, and find that if my cake is cold, the drips cool as I drizzle them on the cake!! That is a GREAT tip! I would not have thought of that but it makes perfect sense! You are a rock star. Thank you so much for the inspiration and the helpful suggestions!!!! Love the cake recipe but I’m from Australia so use metric so just wanting to confirm all your recipes are in imperial measurements? 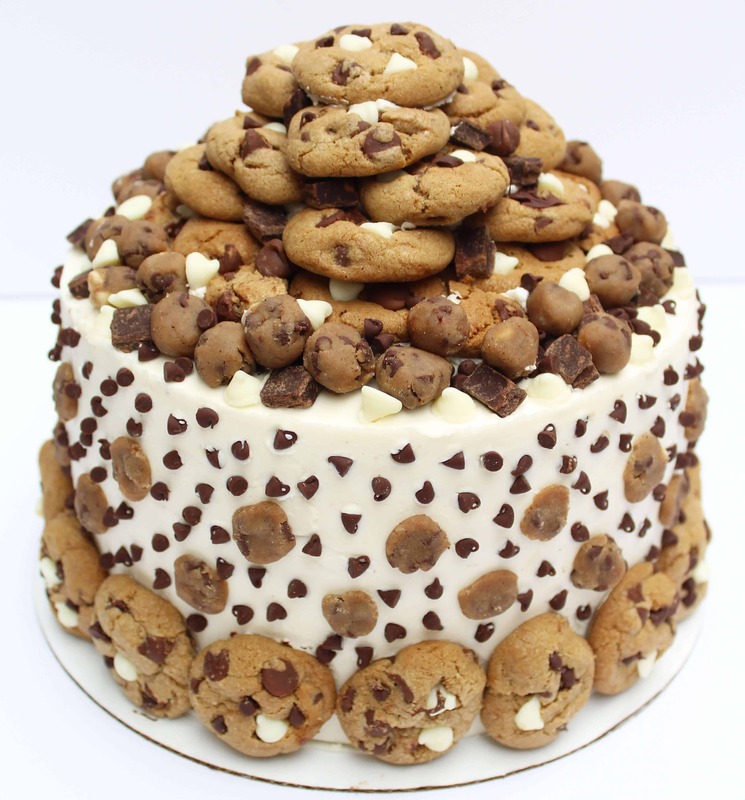 In the food network posting of your cake, the recipe isn’t available so I’m wondering a couple things…..1) the video shows cut up pieces of cookie or cookie dough in between the layers?? 2) the video shows 2 different cookies (chocolate with white chocolate chip and regular chocolate chip I think) can you provide both recipes? 3) do you use melted baking chocolate for the drips or do you add cream? If so can you provide the ratio of cream to chocolate? Thank you in advance!! What’s the recipe.for the dark chocolate cookie? It can be found here: https://chelsweets.com/2015/12/21/swirled-brownie-chocolate-chip-cookies/ It’s the brownie cookie batter portion of this cookie recipe! That’s what I thought!! Just wanted to make sure. Thanks!! Hello!! About how many days in advance can this cake be baked and assembled? If you put the cookies on, I’d say only a day or two! The cookies will go stale :/ If you want to add the cookies though, several days! HUGE hit in my house. The buttercream is amazing. Decorating allows for much creativity. Thinking about doing this as cupcakes in the future, filling them with a bit of frosting and a few cookie dough balls, then decorating on top with frosting, ganache, and a cookie. The only problem was how to cut a four layer cake and keep it looking neat!!! Did you us the cookie dough buttercream for the outside of the cake and the filling 2? I can’t wait to make this cake for my son’s birthday! Quick question though … when making the cookies, if I want to make a huge centerpiece cookie what changes do I need to make? Should I flatten the cookie ball? How long do I cook it for? Thanks! I don’t have four 8 in pans, but I have three 9 in pans. Would it work the same? yup! But keep an eye on them, the bake time may be slightly different! I know that you made this post several years ago and was wondering if the chocolate cake recipe listed is the one that you still recommend using for the Ultimate Chocolate Chip Cookie Dough Cake. You have “The Best Chocolate Layer Cake recipe”, “Moist Chocolate Cake recipe” and this one. Just wanted to make sure you haven’t change your mind over the years and prefer to use a different chocolate cake recipe instead of the one. Thanks! This looks so amazing. Is the smaller version a half recipe? I want to make this but there are only a few of us to eat it and I hate to waste any since it only keeps a few days. the smaller version is a half recipe! For smaller cakes, I use a half batch of cake batter to make 3, 6-inch cake layers! Hope that helps, happy baking! !